Our first 3DTangle Shading Challenge at the Shading Zentangle® Facebook group. The selected focus tangle pattern is Inapod, mirroring the Square One Facebook group so that those who want to post their results on both groups can do so. I think I cheated a little on the first one: the BULK of the shading is supposed to go to Inapod, but I felt I spent a lot more time on the rest of the design. I have two excuses: first, I was sick as a dog with the flu -- again -- and secondly, I really wanted to explore what I call "echo lines", which Inapod is perfect for. I made up this name, so if you know of the "official name" for this depth perception enhancer, let me know. "Echo Lines" are dimensional enhancers, that is, they mirror the shape of the object into the distance, producing a super deep effect which can help deep shading. In a way, they are like Aura lines, but they do not expand outward in parallel fashion, instead, they tend to go inward and smaller, not always parallel to each other. Echo Lines are different than Auras also because they can mimic other objects, such as pearls, and they sometimes intertwine with each other. The tend to get really small around the edges of a specific area. 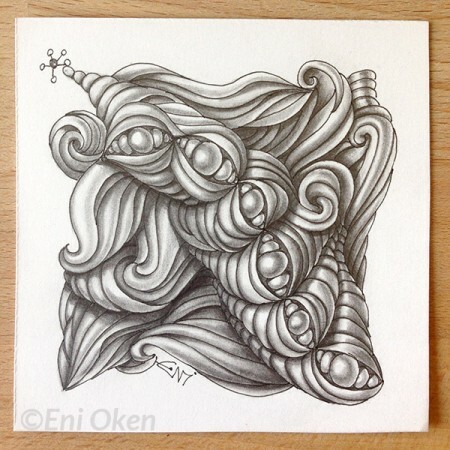 This piece was created on Bristol Smooth paper and measures 3.5 x 3.5 inches. The line art was created using fine liner pen 0.1mm and the shading was entirely done using HB pencil.